Earthquakes. Wildfires. Floods. Drought. Tornadoes. Snakes in the sea, mountain lions, and a plague of bees. 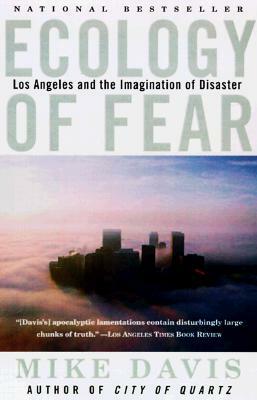 In this controversial tour de force of scholarship, unsparing vision, and inspired writing, Mike Davis, the author of City of Quartz, revisits Los Angeles as a Book of the Apocalypse theme park. By brilliantly juxtaposing L.A.'s fragile natural ecology with its disastrous environmental and social history, he compellingly shows a city deliberately put in harm's way by land developers, builders, and politicians, even as the incalculable toll of inevitable future catas-trophe continues to accumulate. Counterpointing L.A.'s central role in America's fantasy life--the city has been destroyed no less than 138 times in novels and films since 1909--with its wanton denial of its own real history, Davis creates a revelatory kaleidoscope of American fact, imagery, and sensibility. Drawing upon a vast array of sources, Ecology of Fear meticulously captures the nation's violent malaise and desperate social unease at the millennial end of "the American century." With savagely entertaining wit and compassionate rage, this book conducts a devastating reconnaissance of our all-too-likely urban future.